Update 12 November 2018: read analysis by Corporate Watch of Lewisham Councillors involved in the demolition of Tidemill Garden and Reginald House here. Recently, Cllr Paul Bell, Lewisham's Cabinet Member for Housing, described Tidemill campaigners as "middle class anarchists who don't care about working class families in housing need". 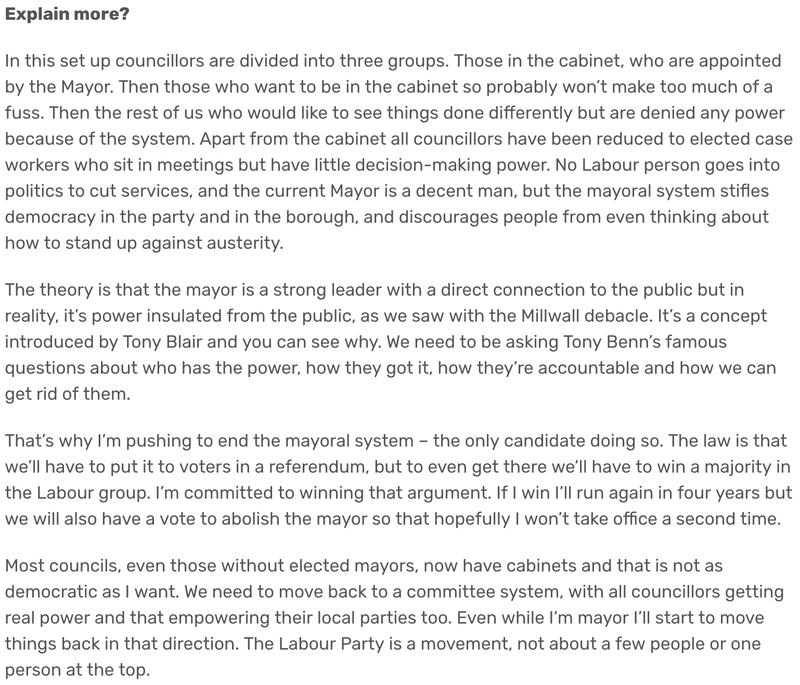 Paul Bell's grasp of reality has been questionable ever since he rather hypocritically took up position in the Mayor's cabinet, having also stood in the Mayoral elections on a platform to get rid of the elected Mayoral system (and its unelected Cabinet)! 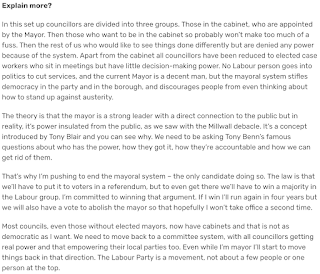 Although all mention of this aim has been deleted from his blog, this Clarion interview with him from September 2017 spells out his previous views: "the reality is that the system of having a directly, elected executive mayor makes collective decision-making we need to fight austerity very difficult, as power is not shared between all councillors, which is why I want to abolish it." The article is worth reading in full. Criticism of Tidemill campaigners has long been aided and abetted by another career politician, Joe Dromey – who, once re-elected in May 2018, along with his fellow re-elected councillor Brenda Dacres, couldn't wait to stand as an MP for Lewisham East when Heidi Alexander stood down. Within a few days of being re-elected! Joe Dromey has been vigorously defending the Tidemill application on Twitter and Facebook since he spoke in favour of it at the bogus planning meeting back in September 2017, posting up the same mantra about homelessness, getting figures wrong, and refusing to listen to counter argument. His engagement on social media in defence of the scheme has been so sustained (minute-by-minute), it's a wonder he actually does any paid work, either in his day job or as a councillor. Cllr Paul Bell's assimilation of campaigners is deeply flawed and disrespectful. For starters, some Tidemill campaigners are paid up members of the Labour Party, and some support the Greens. Nor can they all be described as middle class. If opposing a Lewisham Council plan to demolish housing and green space means you're both an anarchist and middle class, then there's thousands of anarchists in Lewisham! The fact is, while Labour won 60% of votes in the local elections, only 37% of the electorate voted. Out of a population of 306,000, less than 20% voted for the current Council. In New X Ward, the turn out was only 33% of the registered electorate, so Dromey's exorbitant claim for a Labour mandate in New Cross and Deptford is totally invalid (and also not very sincere, as he couldn't wait to jump ship!). Perhaps Bell meant to say "artists" rather than 'anarchists'? There are certainly plenty of them in the campaign and the current occupation – painters, writers, musicians, theatre practitioners, film-makers, photographers, performance artists, sculptors, designers and architects – working collectively with people from countless other professions, jobs and walks of life, and all prepared to defend to the hilt what they believe is right. Perhaps the only type of people missing from the campaign might be politicians. But no, in fact the campaign has received cross-party support from GLA members Len Duvall (GLA Assembly Member for Lewisham & Greenwich and Chair of London Labour), Caroline Pigeon (Lib Dem), and Caroline Russell (Green Party). The campaign has also been supported by the Campaign for the Protection of Rural England, London Wildlife Trust, London Play, the Alliance for Childhood and others. Significantly, Cllr Paul Bell served on the Strategic Planning Committee when the planning application was first submitted in September 2016. Bell said at the time that there appeared to be no justification for the demolition of existing housing (Reginald House). Because Family Mosaic were only offering 11% 'social' housing (which would in fact be 'London Affordable Rent' not real social housing), the demolition of Reginald House, the loss of green space and neighbours' loss of light could not be justified. Campaigners then pursued all the so-called democratic channels available to them to persuade the council to change their plans. In meetings held before the planning application was resubmitted in September 2017, none of the issues raised by the campaign (such as demolition of sound Council homes against the residents' wishes) were addressed – the Council only wanted to talk about the new landscaping with what they described as "the gardening group". As previously reported planning permission was granted in September 2017 with only 37% social housing on the table. It was another six months before the the Council announced they had secured 53% social housing by pledging £4.3m of Right To Buy receipts into the plan, effectively subsidising the developer for profits lost on changing previously planned private homes to 'affordable'. Since the 2017 decision, campaigners had lobbied countless stitched up Council meetings and bogus Scrutiny Committee meetings – the most recent being the total lack of scrutiny of the new Mayor & Cabinet's decision to renew their contract with Peabody (formerly Family Mosaic) and Sherrygreen Homes. Campaigners saw the contract renewal as an opportunity for the Council to reconsider their plans. But in response to the campaign group's lobbying of all Lewisham's councillors, Cllr Paul Bell put out a Briefing to the Labour Group explaining the Council's reasons for proceeding – whilst also admitting the Council would not suffer any legal consequences by not renewing the contract. The fact that Family Mosaic (now Peabody) had spent £3m already but had nothing to show for it was due partly to not being able to get on and build at Amersham Vale (approved in 2015), to which the Tidemill plans were twinned in the Southern Housing Sites scheme, and also due to the delays caused by them not stumping up a high enough quota of affordable housing. They only have themselves to blame. Nevertheless, the Council put out a press story that they would be sued by the developer if they did not go ahead. Confident that they had won the battle, the Council's Regeneration Team gave notice on the garden for the 'gardening group' (which by now was a full-on campaign known as Save Reginald, Save Tidemill) to hand back the keys. When they came to lock up the garden at 6am in the morning on August 29th, the campaigners were ready to occupy it. Tents and tree houses had been erected the previous night and a vocal crowd gathered outside. Council Regeneration Officers did not even attempt approaching the gates, claiming (untruly) that the protesters were violent and not even part of the campaign group. Only two days before, the campaign had applied to the High Court for permission to mount a Judicial Review of the 2017 Planning Application, for which they had begun crowd-funding. Three weeks later, on September 20th bailiffs served a Possession Order to 'Persons Unknown' (despite the Council knowing who the campaigners are), but this was fought off a week later in Bromley County Court and the possession order was postponed on the grounds that an application for Judicial Review was in progress, and its outcome was to be awaited. Unfortunately the Judicial Review application was refused by a High Court judge who failed to understand the technical point on which the case was based. Undaunted, the occupation continues, whilst a further 'oral hearing' for Judicial Review is pursued. A third option is to appeal should the oral hearing fail. In the meantime, a further eviction order has now been served by the Council. The occupation has now been in place for 8 weeks and has generated much interest in the media, with BBC London Live, BBC Radio London and independent film-makers coming down to report. The garden has been open to the public during most of that time, with local people bringing food and supplies to the occupiers. Support has grown hugely for the campaign, whilst Lewisham Council's popularity ratings have declined considerably (except among themselves). 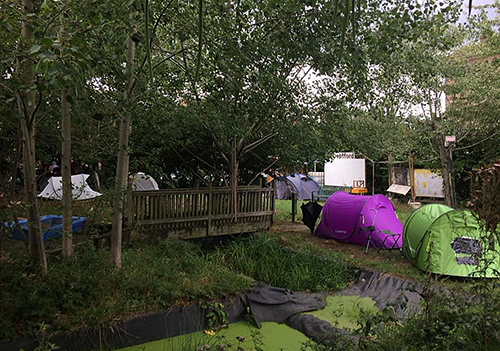 Other accounts can be found on YouTube – search "Tidemill Eviction".